Pinterest has taken the web by storm, and site owners and page developers have been quick to integrate Pinterest sharing features into their site. 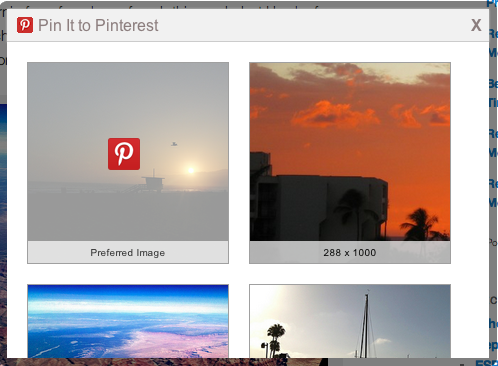 Today we’re excited to release what we think is the best and easiest way for pages to integrate Pinterest sharing. We’re not just bragging here… let us prove it! AddThis now lets sites integrate Pinterest sharing with one simple code snippet and no additional configuration requirements. What makes this special? Developers don’t need to worry about specific configuration to specify images for their pages — something that can be challenging with other tools, including Pinterest’s. Include AddThis, and Pinterest will “just work”. And the best part? A test before launch showed a 20% growth in shares. People following brands on Pinterest has increased 26% in the last month. Over 50% of sharing on pinterest via mobile comes from iPad. Pinterest users are less tech savvy favoring the browsers that ship with their computer versus installing Firefox or Chrome. In May, referral traffic from Pinterest was higher by 30% than Twitter across the AddThis network. In June, sharing to Pinterest has passed Tumblr and Google +1. Sharing to Pinterest is 6% greater than Tumblr and 7% greater than Google +1. Pinterest dominates in English speaking countries (US, UK, CA, AU). The top most country that shares via Pinterest that is not English speaking is India, followed by Brazil and Germany. With numbers that like that, it’s crazy not to give your users easy access to sharing to Pinterest – and now with our easy integration, you have no excuse! As always, please let us know if you have any questions or feedback about any of the AddThis suite of tools! AddThis has long been committed to standardizing the way in which content is shared across the web. Today we’re excited to announce core product support for another emerging building block in the open sharing ecosystem. It’s called Web Intents. Web Intents is an open specification being developed within the W3C process. It allows web pages to more easily and securely invoke external services on behalf of users. In plain English, this spec is a way for a web browser to help users connect to useful services on the web for performing certain common actions — things like save, share, and print. For example, a web page can indicate that it contains some content a user might want to save. A user’s browser can detect that, help the user choose a suitable service, and then actually save the content. Same goes for printing, even for the most basic type of sharing — sending a URL to some other service. You can learn more about Web Intents and what they can do at webintents.org or the W3C site. How does AddThis work with Web Intents? We’re announcing 3 things today. All of the bits are either already deployed or will be rolling out over the coming days. 1. AddThis sharing tools can invoke Web Intents. AddThis social tools are the easiest way to integrate sharing functionality into your site. That’s not just true for deploying Pinterest, Facebook, or over 300 other services and custom interfaces — it’s also true for access to basic Web Intents. When a developer includes AddThis in a page, users immediately get access to any intent handlers that are registered with their browser. No handlers registered? That’s ok too, it won’t hurt anything and you’ll still get AddThis-powered sharing and analytics as usual. 2. AddThis makes Web Intents work, even if the browser doesn’t support them. By adding AddThis to a page, a site developer can feel free to use Web Intents to initiate sharing actions. AddThis makes sure the handlers are there, and lets users invoke the tools and share content, even without any browser support. Site developers can relax and not worry about figuring out a complex matrix of browser support for their pages. 3. AddThis sharing tools can handle sharing actions. If a page includes a share intent, AddThis can handle it. End users can share content to any of our 300+ services. AddThis ensures that web intents retains all the flexibility of current sharing tools from day one. We’re extremely excited to help take another step toward open sharing by supporting and participating in the work on this emerging specification. We’ll be continuing to add support to our products and talking more about implementation details here and in our docs. We’ll also be talking quite a bit more about Web Intents to users, site operators, and the over 300 service providers we’ve integrated with across the globe. We’ll be releasing tools to make Web Intents support easier and more valuable for all of them. The more progress the web is able to make on the mechanics of sending content from point A to point B, the more AddThis can stay focused on the optimization, analytics, and unique social experiences that you’ve come to expect from us and our tools. Check back on this blog to stay up-to-date on our support and ongoing product enhancements around Web Intents. Announced last week, we’re pleased to be leading the development of an open protocol for content sharing on the web, OExchange. We’re also actively working OExchange support into our products in a number of ways. Here’s an update on a few of them. This means AddThis makes almost 300 different services on the web into fully compliant OExchange targets! Read more about this in the API documentation. Sharing, loosely defined, is one of the key use-cases for web-wide interoperability. It is also central to the discussion of a “more open” alternative to the dominance of a few key players. A truly open content sharing model is more than a domain that starts with “open”, more than deciding whether you are a Twitter person or a Facebook person, and more than an open-source version of a popular commercial service. Users should be able to share any content to any one of an unbounded number of services, in a completely personalized way. Sharing features should dynamically adapt to support the communities of interest users actually participate in and the tools they use, whatever platforms they are built on, whether or not they exist at design time. Services should be able to receive content from anywhere, in a common way. AddThis is a business built on sharing, but we believe that basic service interoperability benefits the web at large — services, users, and content providers. I’ll explain our view of this sharing model and, more importantly, how to practically implement it today with a suite of open specifications, including the recently-proposed OExchange.